Right now we’re in England, and later today we’ll be in Germany, but I thought I’d jump to the other side of the globe and post some pictures from our trip to San Francisco a couple weeks ago. We traveled there to photograph a wedding, but we scheduled our trip to give us some free time to explore the city and visit friends. 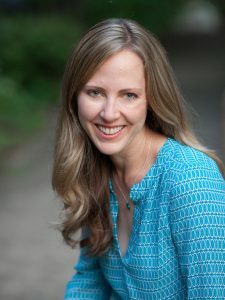 We didn’t take many personal photos on that trip, but I thought I’d post the few that we took. It’s bizarre to me that August is so cold in San Francisco! 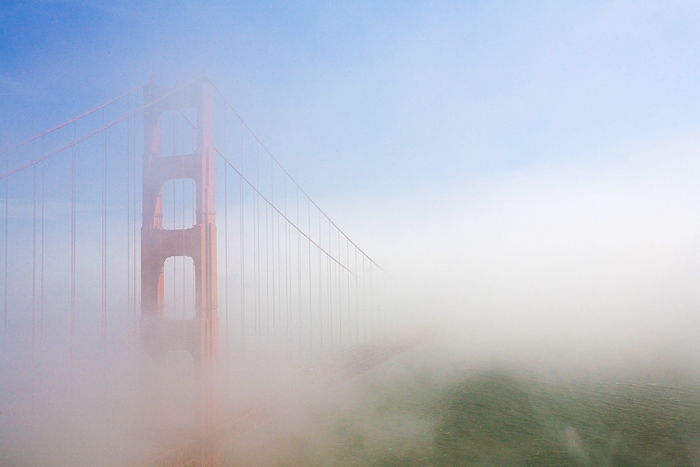 The fog was thick every day of our trip, and we could barely see the Golden Gate Bridge. We drove over to the Marin Headlands for a scenic view of the Bay, but all we could see was an occasional glimpse of a foggy bridge. 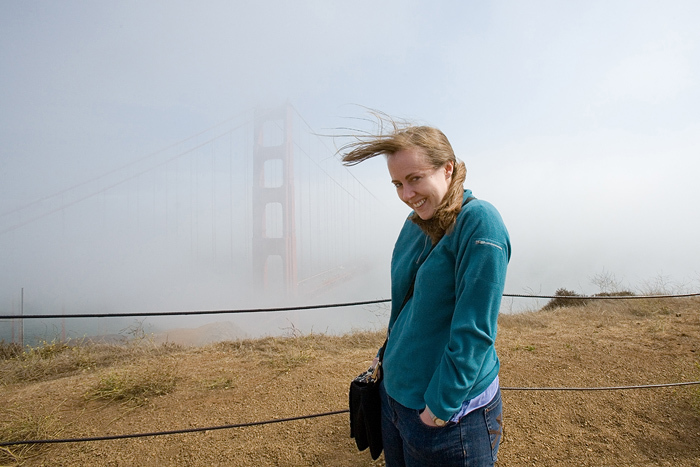 The wind was blowing so fiercely that the fog whirled up the cliffs and past us like a rushing stream. It was a fascinating phenomenon. We walked all over that lovely city, climbing the wacky hills almost effortlessly. It’s fun to live at high altitude and travel to sea level, because the extra oxygen in our blood makes us feel invincible. One of the highlights of our trip was the Chihuly exhibit at the de Young art museum. I took a few photos of that, because I wanted to take a piece of his colorful fantasy and take it home with me. 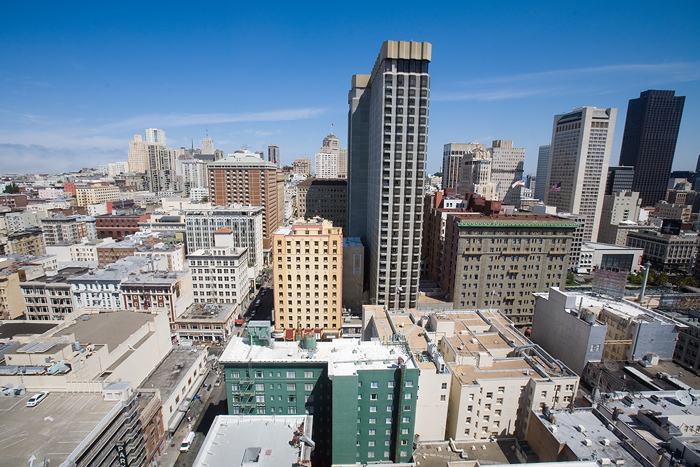 We stayed at Hotel Nikko near Union Square, and this was the view looking north. We walked all the way to Golden Gate Park to see the incredible Chihuly exhibit. 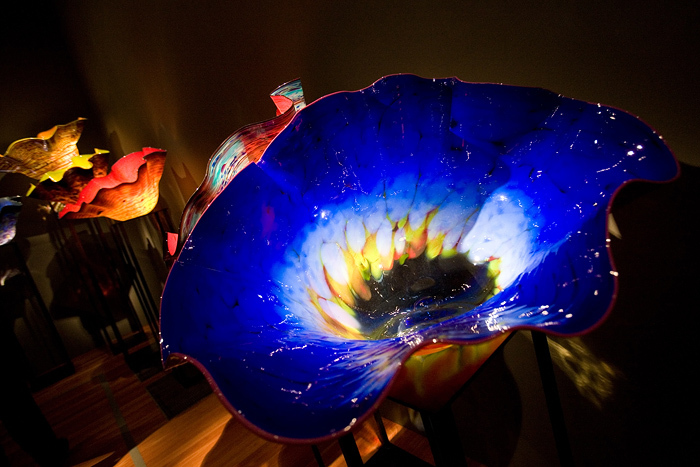 Chihuly creates vividly colorful glass sculptures that were displayed in dark rooms. 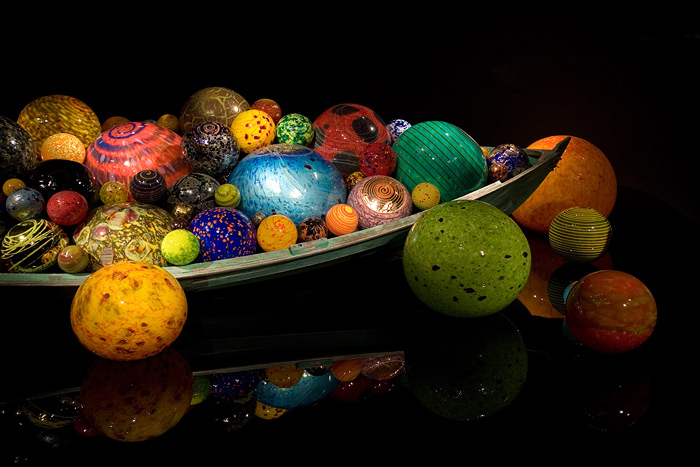 Each of these glass balls was created with great effort. Beautiful. The boat on the right looks like something from a Dr. Seuss book. 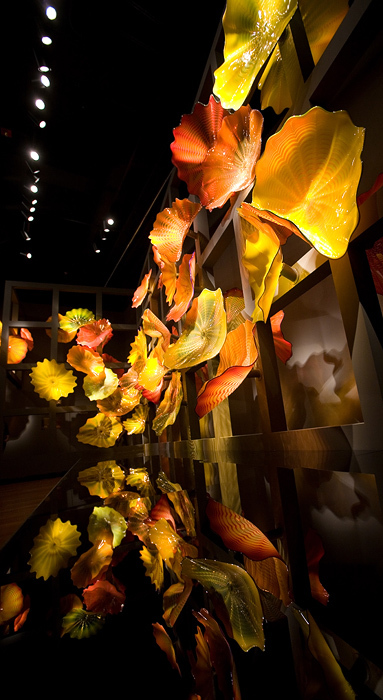 I want to live in Chihuly’s imagination. 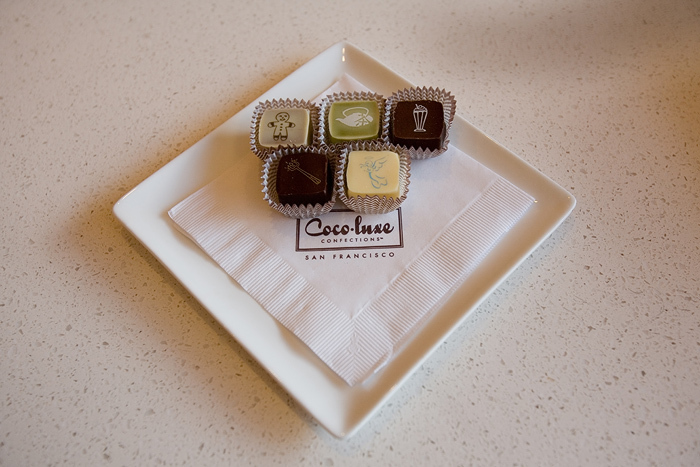 We walked through the Haight District and ate some delicious truffles at Coco-luxe. 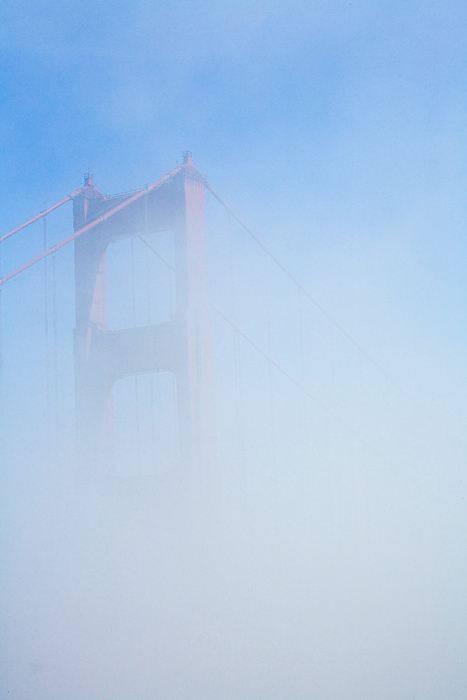 The next day we drove to the Marin Headlands, and this was all we could see of the Bridge, even close up. Lizzie and Richard: A wedding in the English countryside! It´s not that far away from here (Dortmund), but I´ve never been there for more than “Buchmesse”. 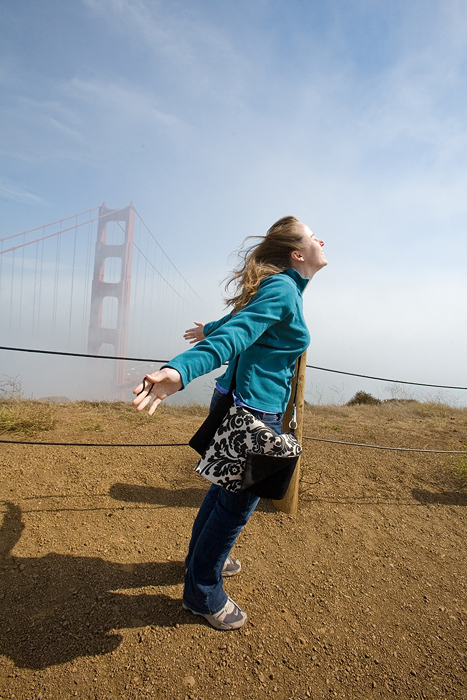 San Francisco is one of my favorite cities, too! I would love to! We certainly hope to get back there soon! Yup, that’s the same guy! I love the Bellagio glass! That’s so cool that you guys went to Chihuly and Coco-Luxe also! I hope you had as much fun as we did. I can understand the desire to take pics of the exhibit, even with a crappy cell phone cam. There was something so intoxicating about those colors that I just had to take a piece of them home with me. I love my Shootsac! I use it all the time and it’s been a huge help for me. My only problem with it is that the strap is unpadded, uncomfortable, and gets twisted a lot. I’ve never been to San Francisco, but I have been to Los Angeles twice. Guess the urban legend of San Francisco having more fog than London must be true! wow, that first photo is almost exactly like one i took, i believe my husband and i stayed at the hotel to that photos right… crazy! now off to look at the UK wedding photos… once again, simply beautiful! I hope you’ll take this as a compliment: in the very first picture, you look like you’re in your teens again. Those photographs of San Francisco bring back memories. San Francisco is one of my favorite cities. You owe us a visit next time you’re in town!! this must be the same guy that has awesome glass sculptures in the bellagio! How funny! We just went to the Chihuly exhibit and Coco-Luxe yesterday. The exhibit was amazing! I love all the photos, nice job. Germany ? Where in Germany ? that pretty pack you’re wearing…i know you’ve talked about it before..but could you give me a link to where you got yours? i think they’re so pretty and i could use one! Aww, you were just like a hop skip an a jump from my school. Great photos! 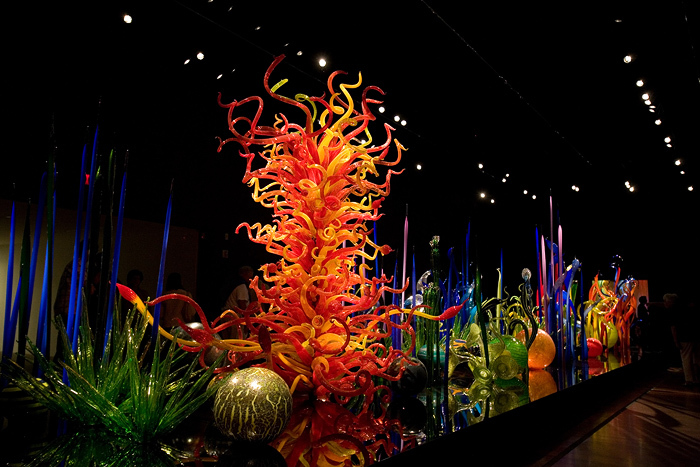 I love Chihuly! I saw his exhibit at the Oklahoma City Art Museum when I was in HS. 🙂 I definitely need to visit SF someday! I am from the Bay Area…I love that city! I live in Washington now so I am not too far away! Great pictures! I love that city. It just feels so full of potential every time that I go. BTW: How do you like your shootsac? I’m seriously considering getting one. even foggy … it’s gorgeous. Thanks for sharing exhibit pictures…they’re gorgeous! Judd goes to SF every year in December and I love tagging along! We’ve stayed in the Hotel Nikko a few times and I love it too…convenient to everything, and a nice cool Japanese flair to it. 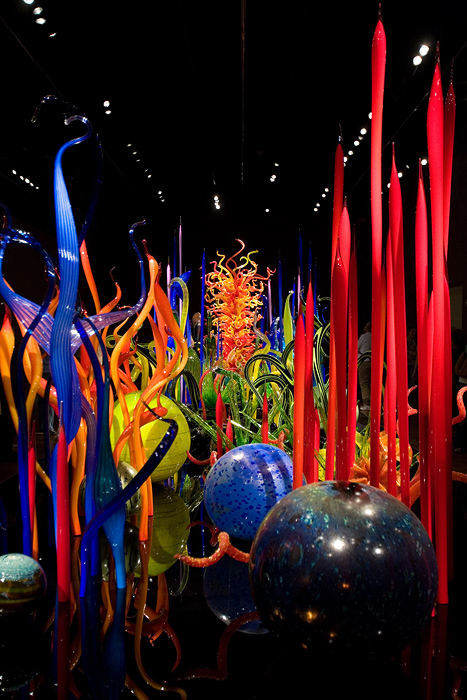 That Chihuly exhibit looked amazing! Oooo, that last bridge photo looks like someone’s dream remembrance of the bridge! 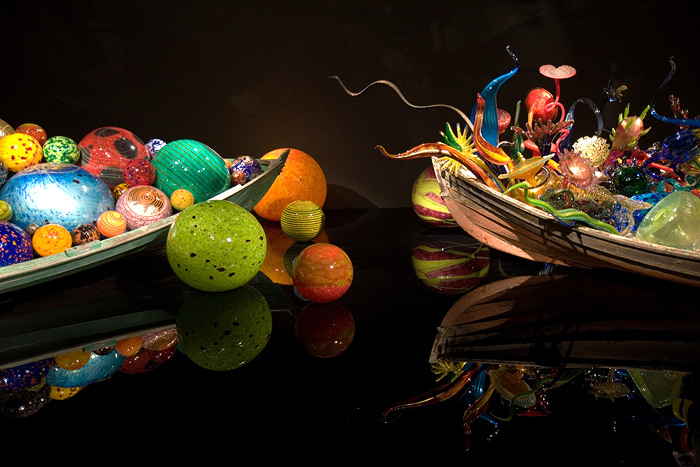 Those Chihuly sculptures are SO AWESOME! I mean, how FUN!